“Hi, my name is Mike. 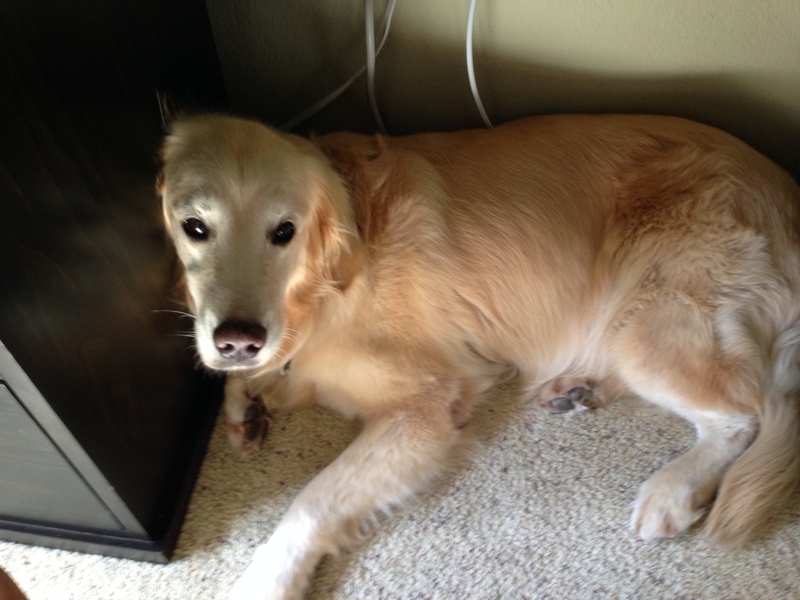 I have your dog Latte who was loose in front of my house”. I went on to tell the person on the phone my street and she says, “I’m right around the corner. Just let her loose, I’ll call her and she’ll come home”. Me (out -loud): “How about I walk to the corner and make sure she sees you”?. Me (thinking): How about I walk to the corner to make sure you actually come out of your house, and that the dog is safe to get home before I just let her loose? How about I make sure a car doesn’t come screaming down the street just as I let her off the leash? How about you show as much concern for your sweet little dog as I did when I took time to gain her trust, get her on a leash and hold on to her until she found her way home!. Geesh…. I walked to the corner and saw the owner in front of her house who waved at me nonchalantly. I made sure it was safe and I let Latte loose who ran home to her mom. 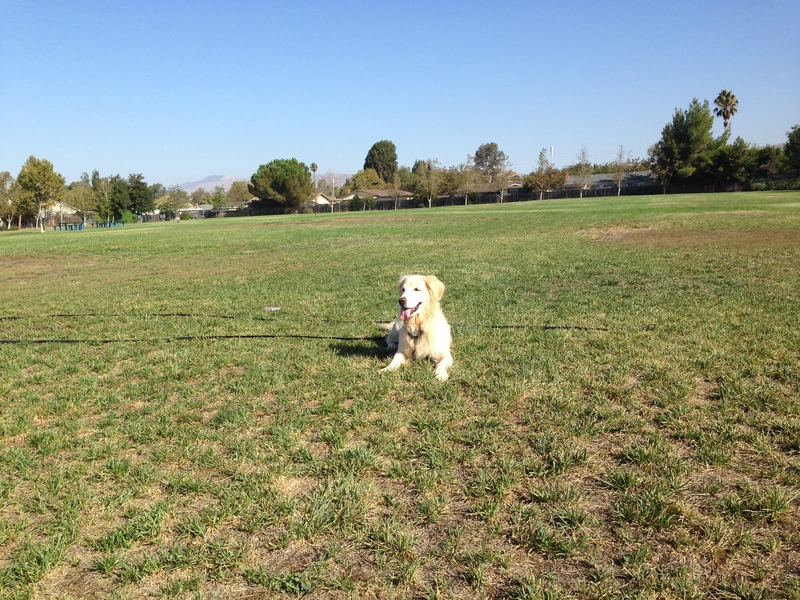 Kali and I had been on our way to a nearby elementary school’s grass field to do some long leash training. 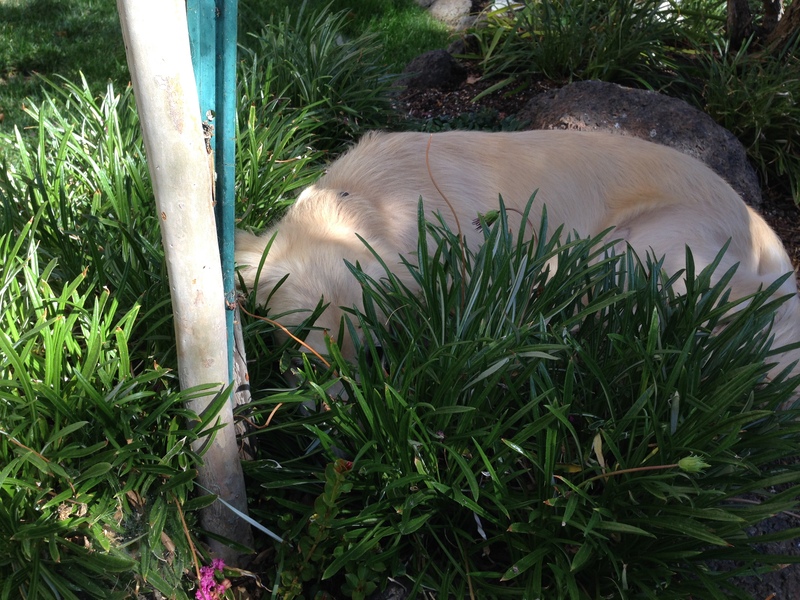 As we exited the garage there was little Latte sniffing around our front yard. Kali starting barking and tugging but to her credit and to mine I was able to get her to focus on me and not so much on Latte. I used it as a training opportunity but after a minute or so it was too much for Kali and I put her back in the house, turned my attention to Latte, and as you already know got her home safely. I had met Latte’s mom once before in front of the house. She seemed very nice as she did today when she waved at me to let Latte go. 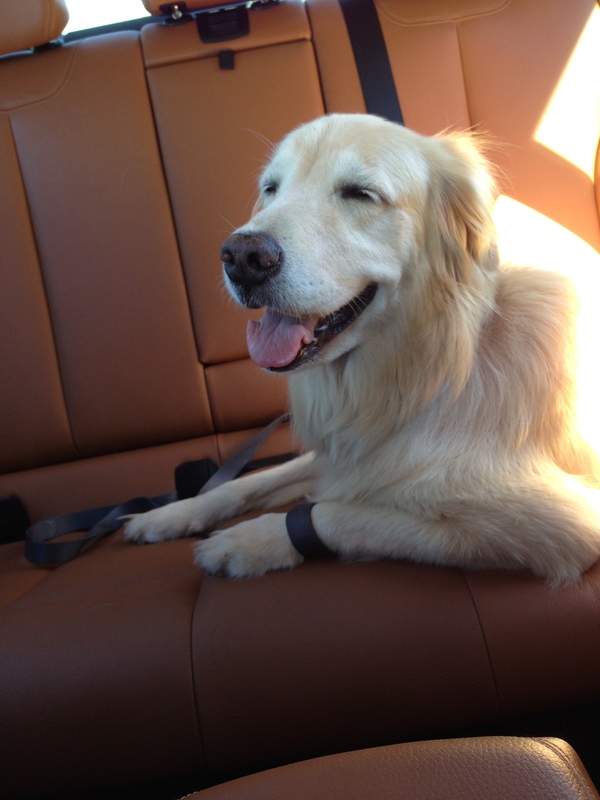 Latte appeared to be smart, trained, and obedient. But I couldn’t help judge the mom for being so casual about telling me to let her dog off lease so that the dog could run home at the sound of her voice. We live on a very quiet street with few cars passing by. So after all, what were the chances a car would come speeding around the corner if I had let her go as the mom asked? And what are the chances that car would not have seen the dog in time to stop? One in Ten? One in a hundred? Let’s assume one in a hundred. Pretty good odds the dog makes it home safely, right? Odds the mom was apparently willing to take; or more likely hadn’t considered. I liked the odds with my approach better: I keep the dog on the leash until I see the mom, I make sure I can let the dog off the leash without putting it in harms way, and we all get home alive. So that’s what I did. Walking back to the house I felt a bit angry at the mom and a little angry at myself for being judgmental. But I felt very good that Latte was home safe. Meanwhile, as I walk back into the house to get Kali she and Smokey are all worked up having observed dad through the window spending so much time with another dog. Kali had the double whammy of having her walk and training session pre-empted by the little canine intruder. Finally though, Kali and I headed out and had a great training session at the school and then a nice slow walk home. It’s Sunday morning and like most mornings I dedicate a significant portion of my time tending to Kali’s needs: up early, delicious and healthy breakfast, a little playtime, a walk, and maybe a brushing or teeth cleaning. The other side of that equation is that Kali also dedicates a significant portion of her time to me: lots of love, attentiveness, a little play time, a good student, sleeping at my feet while I work (this will be great during the winter because I don’t like wearing shoes), and just being, well, Kali. 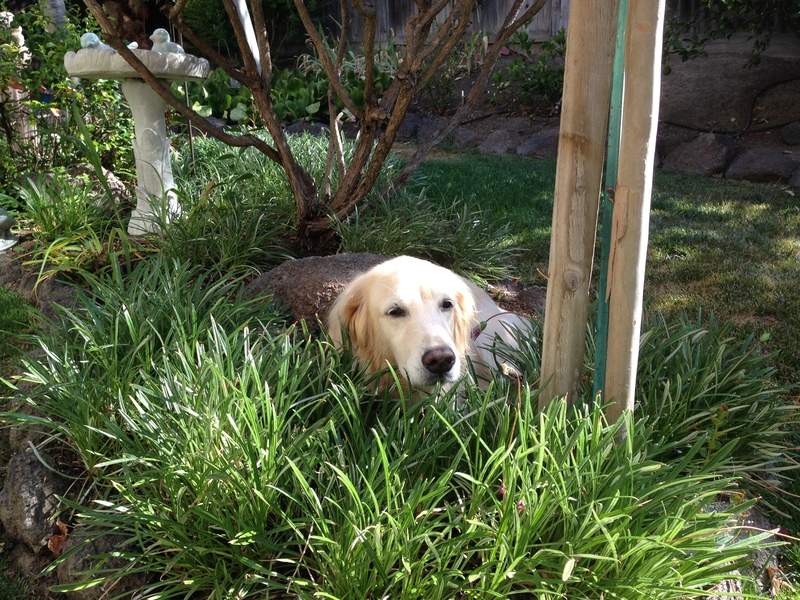 That wonderful dog originally named Nala from Taiwan who has brought so much love into our lives. We’ve had triple digit weather for the past few days. With the severe drought and water rationing much of my typically lush backyard is dry, dying, or dead. I’m a hot weather person who prefers 95 degrees over 75. So, other than the drought and dead or dying trees and plants it’s all good. Kali seems to enjoy the hot weather too. 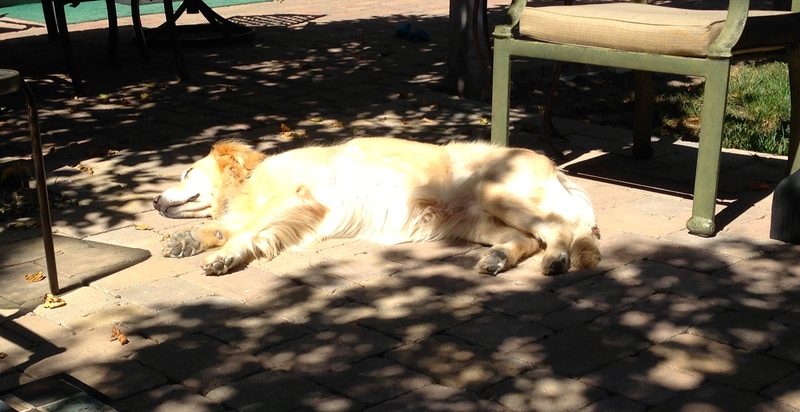 In fact she chooses to sleep in the hot sun versus the cool shade even when it’s 90 as it is now while I sit outside writing this blog. There’s plenty of shade all around her and Kali chooses to sleep in the spot getting the sun. 90 Degrees and Kali chooses the sun over the shade? Better get out the sun block…. Recently we went to the park and did some long leash training. With the 30 foot leash I was able to move far away from Kali and she was just great at staying engaged and following commands as I moved around within about a 30 foot perimeter. After a while I began to run – back and forth – Kali followed so nicely by my side consistently checking with my eyes to see if she was doing well (and if she would get a treat). She got a pretty good workout and when we returned home, this time she chose the cool flowers to sleep in and not the sun. Since Kali arrived in May it’s been very warm and dry almost every day. With a little luck California will get plenty of rain this fall and winter. As much as I dislike the cold and wet we need the rain. Kali and I will have to adjust our routine to account for wet trails, cold days, and not much hot sun to sleep in. When Winter arrives I’ll be complaining as I do every year longing for summer once again. But knowing Kalas Marie she will take everything in stride – wet coat, cold ground, muddy paws and all. What a scare Kali and I had this morning! By chance we found ourselves in the middle of an incredibly frightening event. We saw a young chocolate lab come within inches of tragedy. Our walk started out pleasantly uneventful. Kali still becomes very anxious around other dogs when we meet them along the trail. She’s getting better. Or I guess I can say we’re getting better. Through a considerable amount of time and training I’ve learned to help Kali stay engaged with me when we come across other dogs. Lately she’s more inclined to maintain eye contact with me instead of focusing on the other dogs and barking at them. Without knowing what Kali may have experienced as a homeless stray it’s hard to know exactly the reason for this anxiety. But lately, more often than not, we’re able to move along our way with little to no barking and a lower level of anxiety. I hope this progress will eventually lead to Kali’s ability to meet new dogs she encounters with a smile, a sniff, and new friendships. Kali and I have a few routes we alternate between along our walking trail. But recently part of our main and favorite route was closed off requiring us to detour onto residential streets to get home. So today as we passed the closed off path and headed home I spied a young chocolate lab across the street. Her owner had let her out of her car off leash as she prepared to take the dog – “Mia” – and her toddler into an area where owners often allow their dogs to roam freely along the grassland and trails. The area is safe for the dogs as it is vast and, with the exception of the entry area, fenced off or surrounded by creeks and hills. As the mother got out of the car Mia headed into the grassland. But then Mia saw Kali and I across the street. Kali was focused on me – her eyes looking at my hands and eyes hopeful for a training treat. Mia froze, barked, then bolted for Kali- heading directly across the street. The 60 foot three-ton bus came speeding down the street, the mom looked up from her toddler and screamed at Mia to stay. Mia continued into the street with no awareness of the 6000 pound bus she was on a collision path with. I screamed, “NO!”. Kali barked, now aware of Mia and probably tuned into my stress level. The bus did it’s best to slow down, breaks squealing and transmission grinding. And then – it sounds corny but – time seemed to stop. The bus slowly passed and went along its way. In the middle of the street stood Mia – unharmed. Thank God. Mia’s mom screamed, “Mia, no – bad! Bad Girl. Come back here. No!” Kali barked. I took a breath, ever so thankful that Mia was OK. I composed myself, regained Kali’s attention, and we headed home. I couldn’t help but be a little mad at Mia’s mom. I scolded myself for being judgmental. And then, I thanked God again. This time for Kali. My beautiful girl who was safe next to me as we walked back home. I think Kali knew I was a bit shaken from the event. She is so in tuned to me. 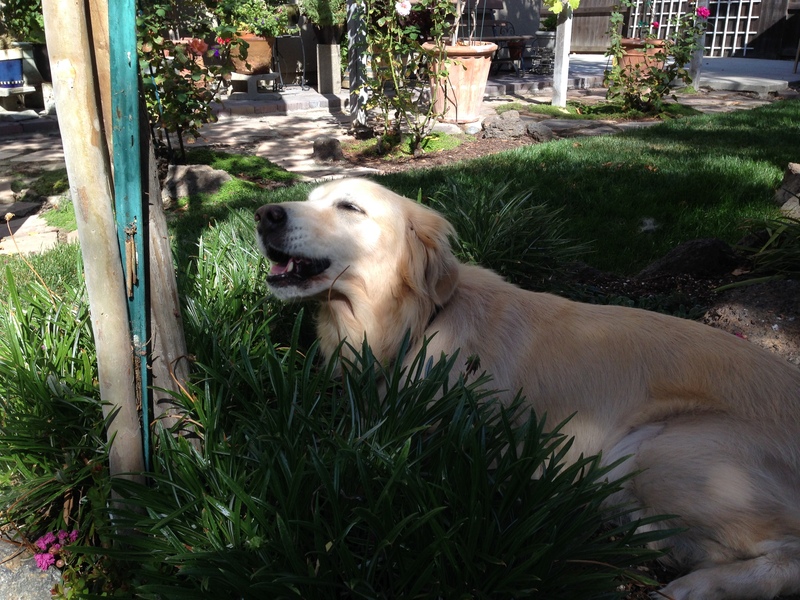 Kali and I walked back home in silence grateful that Mia was OK; and grateful for each other. It’s interesting to see dog people and non-dog people. They’re quite different in the way they greet you when you have a dog on the end of a leash. A dog person begins watching you – the dog actually – from afar and as you get closer the person begins to smile and make eye contact with the dog. They subconsciously hope that the dog will notice and acknowledge them. With a little luck the owner will stop and allow the dog to greet them. Their jackpot is a wagging tail, a doggie smile, and sloppy lick of the hand, or face if they are so bold as to get on their knees for the greeting (as I’m inclined to do). A non-dog person shows indifference to the animal unless they’re scared or annoyed that the owner would bring the dog into the store or wherever the encounter occurred. 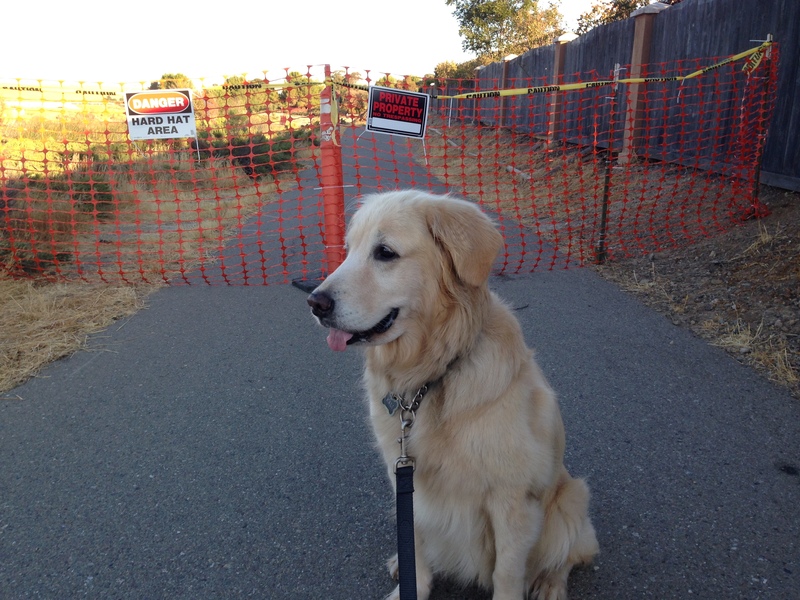 Or, perhaps they’ve observed too may unattended poops on their walking trail. The non-dog person may make eye contact with the owner briefly and some will even force a smile as to say, “yes, I see the dog and I see that you are so proud of the animal but I’m really not interested. Good day and good luck”. Neither is right or wrong. I just happen to think that the non-dog person is missing out on an encounter or relationship that could (will!) enrich their lives forever. Yes – I’m biased. Yes – I’m a proud Papa. Yes, we’re blessed to have Kali in our lives and us in hers. Kali and I meet more dog people than non-dog people. It’s a great feeling to have someone you’ve never met before approach you with a smile and say something like, “what a beautiful dog”, or ” I had a Golden and he/she was the best dog”. Or, a small child’s (and watchful parent’s) eyes fix on Kali praying to meet and maybe pet her. I think children are all born dog people. What child doesn’t love a puppy or want to hug a dog, right? So… this means that the non-dog people were once dog people but somewhere along the way they lost that magic. The good news for the non-dog people is that the dog loves them just as much as the dog people. Which of course is part of that unconditional love all us dog people know so well. Road trip! A happy Kali ready to go out and greet the world.